During the course of my work week, I was craving something crunchy. I can’t explain it but it’s certainly one of those times that I have the strongest, indescribable desire to eat crunchy food. Since I didn’t want potato chips or pretzels, even though it was Super Bowl weekend, I searched my house and found a bag of mixed unshelled nuts. 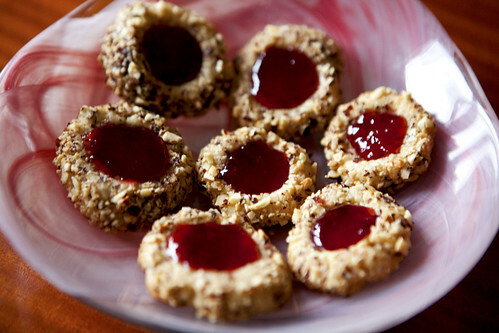 I perused my recipe collection I collected over the years and found this: hazelnut strawberry thumbprint cookies. It’s a simple cookie recipe. The small problem was, I didn’t have enough hazelnuts. (I’m presuming my dad liked that particular nut a lot since there weren’t that many from the beginning.) So, I thought what nut would go with hazelnuts well and almonds popped in my head and I started cracking my way through. After fifteen minutes of nut shell debris flying across my kitchen counter and floor, I had enough nut meat for the recipe. After making the buttery mass of cookie dough, forming it into one-inch balls and rolling it in the coarsely ground, toasted, nuts, it does look like Rocher chocolates, except, of course, it’s made of cookie dough. After baking them the scent of toasted nuts and butter pervaded my kitchen. I tried hard not to eat them when I took them out of the oven. I really did. I forced myself filling these babies with strawberry preserves, making them look like edible, nut encrusted jewels, and not eat a morsel. Yet. After waiting for cooling the cookies was over, I finally ate one. I felt like I finally reached to my peak of desire and everything else faded to nothing. I was in bliss. 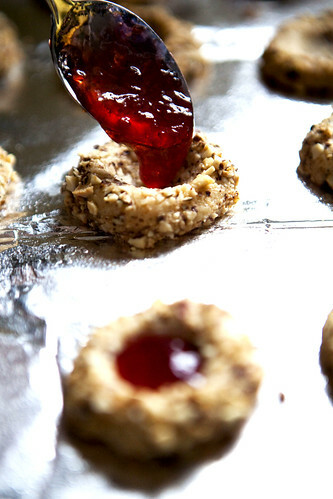 The cookie was delicious – nutty, crisp, buttery and crunchy with a touch of sweetness from the preserves. This is an easy recipe. I made it with strawberry preserves because it’s sort an early ode to Lunar New Year (and ironically, Valentine’s Day falls on the same date this year) but it’s an everyday or every week kind of cookie that has no bounds for holidays. Unless you’re talking about Passover or Lent. Source: Marthastewart.com just made a few adjustments that will be noted. 1. Preheat oven to 325 degrees. Put butter and 1/2 cup sugar in the bowl of an electric mixer fitted with the paddle attachment; mix on medium speed until pale and fluffy, about 3 minutes. Add egg yolk and vanilla, and mix well. Reduce speed to low. Add flour and salt, and mix until just combined. Refrigerate dough for 2 hours. 2. Stir together toasted hazelnuts and remaining 2 tablespoons sugar in a small bowl. 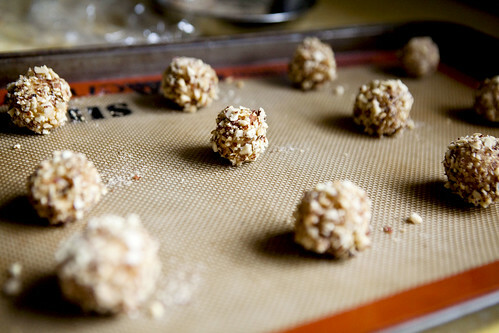 Roll dough into 1-inch balls; dip balls in egg white, then in hazelnut-sugar mixture. Space 1 inch apart on baking sheets lined with parchment paper. Press down center of each ball with your thumb. Bake for 10 minutes. Remove from oven; press down centers again with the end of a wooden spoon. Return to oven. Bake cookies until golden brown, 8 to 10 minutes more. Let cool slightly on sheets on wire racks. 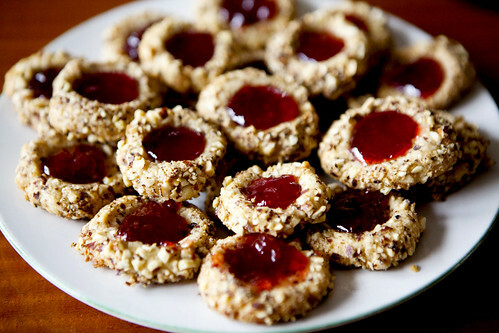 Fill each center with jam. Cookies can be stored in a single layer in airtight containers at room temperature up to 2 days. Loved your snow photos on Flickr too! I’m a bit of a perfectionist when it cones to baking stuff at home. Or maybe I have OCD… Hmm. Hopefully, you’ve noted my minor changes on my recipe. This is so very beautiful. Thanks for sharing this. Happy Valentine’s Day & Lunar New Year! They look so elegant. Great job. My daughter, belleofthebakery.com will appreciate the artistry. Thanks!